India is a place that can capture your heart,no wonder tourists come back,101 Most Beautiful Place. An icon of the city of Kolkata is the Victoria Memorial. This majestic structure stands testimony to the colonial past of the city. The building was designed by Sir William Emerson and is one of the most beautiful structures of modern India. The memorial houses a museum which has several artifacts belonging to the British times. The Royal Gallery here has original oil paintings of the time of Queen Victoria, which take you to the times gone by. Visit the memorial and you will be charmed by the grandeur and the understated elegance o the building. Another architecture masterpiece of India is the Lotus Temple, also known as the Bahai House of Worship. The temple gets its name from its shape which resembles that of a lotus flower. Since it is a Bahai temple, dont expect beautiful idols or priests singing hymns in the premises. In fact, what you see is a large hall where you can sit and chant your prayers, irrespective of your religion. True to a place of worship, the atmosphere of the temple is calm and relaxed, ideal for meditation and spending a few moments with yourself. Dal lake, the iconic destination of the Kashmir valley, also referred to as heaven on earth is one of the bollywoods favorite shooting sights. The mughal gardens by the lakes shore go back to jehangirs reign and the shikaras, houseboats in the lake are the best way to embark upon the nature. A quaint little island in the state of Assam is Majuli. Once upon a time, the island was spread across an area of about 1,250 square kilometers. However, the raging River Brahmaputra has eroded a large part of the island, and what is left now is a little over 400 square kilometers of area.Nevertheless, it is one of the most beautiful places in India. Bird watching is a highlight here, and so are the colorful tribes of the region. Wayanad is a stunning hill station located in the north eastern part of gorgeous Kerala. The hill station is characterized by several tea and coffee plantations, making it ideal for a relaxing holiday. The best way to experience the beauty of Wayanad is to stay in a homestay and enjoy the hospitality of local people.With its low population, verdant greenery, and several beautiful trekking trails, it energizes your body from the inside out. Also known as the Land of Paddy Fields, it is epitome of what Kerala stands for green, tranquil and relaxing. Located in the eastern part of Sikkim, at an altitude of about 12,400 feet is the Tsongmo Lake. You pass this lake while trekking to Nathu La Pass, which lies at the Ind0 China border. Like other lakes of the Himalayan region, this one too is just gorgeous to say the least. You somehow fall in love with it from the moment you set your eyes on it. And unlike other lakes of the region, this one involves a relatively easier trek. 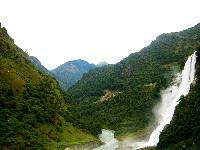 Hidden in the wonders of Tawang in Arunachal Pradesh is the magnificent Nuranang Falls. The falls are about 100 meters high, which might not be much when compared to several other waterfalls in the world.However, when combined with the pristine surroundings, it becomes a must visit when in Arunachal Pradesh. Folklore has it that the falls are named after a girl who helped an Indian soldier during the 1962 Indo Sino War. Also sometimes referred to as the Bong Bong Falls, they also generate electricity for the district. Nestled in the majestic peaks of the Western Ghats is the Malshej Ghat, a popular weekend place for people of Mumbai. It is a place blessed with refreshing greenery and mist covered peaks, especially during the months of August and September. There are some gorgeous waterfalls too to visit here.The place also serves as a habitat for several varieties of birds such as crakes and flamingos, making it a haven for birdwatchers. When here, try the Naneghat Trek for some scintillating views of the valley.